Top 3 Indies Videos Feb 24, 2018! Amyl & The Sniffers, Reckless Drifters, Baby Shakes, The 50 Kaitenz (Jpn)! At #2 is my new fave new group for 2018 (I found Amyl and the Sniffers in 2017!) and their name is the Reckless Drifters and they are from Los Angeles. The Reckless Drifters are Dramarama’s John Easdale & Mark Englert, The Woolly Bandits’ Christa Collins, Miss Derringer’s Sylvain De Muizon, & original Social Distortion drummer Derek O’Brien. This os their debut single and it is a cover of an old Hank Williams tune (Yeah. You read that right, Hank Williams.) My dad loved Hank Williams and when I first heard this rendition it dropped my jaw…. It takes some real special talent to cover a Hank Williams classic and actually make it original and, dare I say it? Better than the original! TODAY’S SPOTLIGHT ARTIST! Today’s spotlight artists are the mighty 50 Kaitenz from Osaka, Japan! The 50 Kaitenz just released their new album and I have been playing some of their new songs on my FM radio show just about every week! (The Mike Rogers Show on InterFM 897 in Tokyo and Radio Neo 79.5 in Nagoya – Please come “Like” my FB page: https://www.facebook.com/MikeRogersShow/) The new record was released on Jan. 17, 2017 and it is simply awesome and I think it’s their best one yet! About Mike in Tokyo Rogers: Mike has been a professional music/TV/radio/anime-related program producer in Japan since the eighties. He began in the music business in 1977 as lead vocalist with the legendary Los Angeles Punk Band, “The Rotters” (Sit on My Face Stevie Nix.). As a university student, he was assistant to the legendary Rodney Bingenheimer (Rodney on the ROQ – KROQ Los Angeles from 1980 ~ 1981.) Mike was the first and only foreigner in Japanese history to become the General Manager of a major Japanese broadcasting station (TV Tokyo owned InterFM). Has produced a few smash hit programs (some real losers, too!) and several of Tokyo’s highest rated and most famous radio programs. A recent hit program was “The TV Show” (Set Program with “Ninja Slayer”) which, between April – Oct. 2015, garnered over 10 million viewers. He is currently producing and hosting “The Mike Rogers Show” every Sunday live on InterFM 89.7 in Tokyo and Radio Neo in Nagoya 79.5 and nationally broadcast on Radiko.jp (Internet radio). And his life’s dream is his just completed full-length motion picture, “Ghostroads – A Japanese Rock and Roll Ghost Story”which was released by a major Japanese motion picture company and in theaters all across Japan from Sept. 2017 ~ Feb. 2018. Top 3 Indies Videos Feb 17, 2018 – Melbourne, Australia Special! Amyl & the Sniffers, Dumb Punts, Parsnip, Stephanies (Jpn)! I’m not a loser, no! And, another new band from Melbourne are four ladies who called themselves, “Parsnip” and describe their music as “Queen Wave.” This is the second time Parsnip has been on the countdown and the first time I put them on, the leader of Japan’s most fab garage rock heroes, Christopher from “The Routes” cheered and told me he had just bought the Parsnip record! You’ll dig this. At #1 is a band who crept up on the scene with their monster hit, “Smoko”! It’s the Chats! The Chats have been together for just over a year now and, actually, their first video, “Smoko” became a viral sensation when it was released in October of 2017 and received about 600,000 views in a few weeks. Now, just 4 months after release their first video has hit over 1.4 million views. Not bad for an unsigned Pub-Punk band, eh wot? Top 3 Indies Videos Feb 10, 2018 – Voiid, Marc Platt, Daisy House, The Stephanies (Japan)! 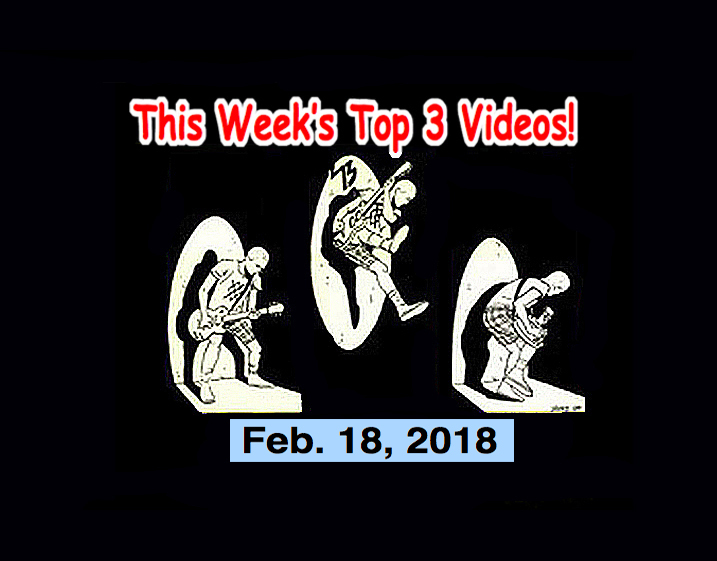 It’s time once again for the Top 3 Indies Artist Video Countdown for Feb 10, 2018! First up is a band introduced to us by Alex Kish of Wassup Rocker Radio fame. Alex has one of the best rock n roll radio shows on the planet. Alex turns us on onto another band from Australia! They are four rocking ladies who call themselves Voiid! They describe themselves as: “A four piece of hellish girl-shriek guaranteed to make your face melt and your boyfriend cry.” Cool! I’m in. This video is cheap as hell but hilarious. I love it! Next up is a guy named Marc Platt from Los Angeles who was the frontman for the early 80s legendary L.A. Power Pop group “The Real Impossibles.” Marc Platt has been branching out on his own and had been bubbling under the hood of his 57 Chevy in Hollywood and has now come out with some hot solo wax. The Marc Platt album is entitled, “Big City” and will be released on April 9, 2018. Today’s track is one of my favorites from that album. I suspect that we’re going to be hearing a lot more from Marc Platt very soon! This band is killer. And today’s song just came out. Check and then tell me how brilliant this is! TODAY’S SPOTLIGHT ARTIST! Today’s Spotlight Artist are no strangers to our countdown. It’s Japan’s own, The Stephanies! The Stephanies will be guests on my radio show on Feb. 18 (Can you believe that these ladies are getting up at 3 am, getting all fancied out and then coming to the studio at 5 am? Are they crazy?! And they are bringing listener presents! Woo-Hoo! Top 3 Indies Videos Feb 3, 2018 – Problem Child, Rosegarden Funeral Party, Parsnip! It’s time once again for the Top 3 Indies Artist Video Countdown for Feb 3, 2018! At this week’s #1 is a female-fronted act from Dallas, Texas named, Rosegarden Funeral Party. Their webpage says: “Inspired by everything from the underground garage’s of the 1960’s, to the Dark Wave, New Wave, Goth, and New Romantic movement’s of the 1980’s, to the shoegazers of the 1990’s, Rosegarden Funeral Party is a band that is as tastefully derivative, yet unique as it’s band name.” Go to their webpage, scroll down and hear their latest, “Horror Music” here. About Mike in Tokyo Rogers: Mike has been a professional music/TV/radio/anime-related program producer in Japan since the eighties. He began in the music business in 1977 as lead vocalist with the legendary Los Angeles Punk Band, “The Rotters” (Sit on My Face Stevie Nix.). As a university student, he was assistant to the legendary Rodney Bingenheimer (Rodney on the ROQ – KROQ Los Angeles from 1980 ~ 1981.) Mike was the first and only foreigner in Japanese history to become the General Manager of a major Japanese broadcasting station (TV Tokyo owned InterFM). Has produced a few smash hit programs (some real losers, too!) and several of Tokyo’s highest rated and most famous radio programs. A recent hit program was “The TV Show” (Set Program with “Ninja Slayer”) which, between April – Oct. 2015, garnered over 10 million viewers. He is currently producing and hosting “The Mike Rogers Show” every Sunday live on InterFM 89.7 in Tokyo and Radio Neo in Nagoya 79.5 and nationally broadcast on Radiko.jp (Internet radio). And his life’s dream is his just completed full-length motion picture, “Ghostroads – A Japanese Rock and Roll Ghost Story”which will be released by a major Japanese motion picture company and in theaters all across Japan in Autumn 2017.